BEWARE! Animals have just invaded your social media accounts. They have been uploading information and pictures about their habitats, diets, size, parts, facts, life cycle, adaptations, predators, and prey. This pack is what your writers need to complete an Animal Research Project in the classroom or at home. 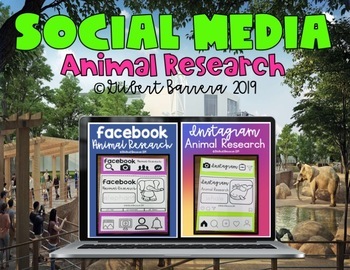 Your writers will be super engage in their animal research project. -The animal research mini-books are differentiated base on your writers needs. -Writers can be creative in choose an animal of their choice or they can choose of the collection in this pack. -Writers can research the following within the mini-book: habitats, diets, size, parts, facts, life cycle, adaptations, predators, and prey. -Animals include: alligator, bear, cat, dog, elephant, fish, giraffe, horse, iguana, jellyfish, kangaroo, lion, monkey, newt, ostrich, pig, quail, rabbit, snake, turtle, urchin, vulture, whale, x-ray fish, yak, and zebra.